I’ve wanted to paint the library in our house since Day One. I hate that off-white color that all apartments and new houses have when you move in, and I’ve been on a mission to paint every room. Aside from bathrooms, which I can live with longer, the library has been the lone common area room left to tackle. 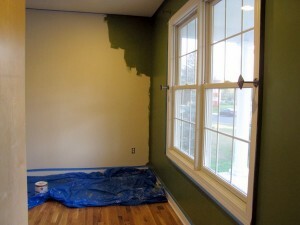 I think we didn’t paint it before we moved in because it was already getting expensive to paint all the other rooms. 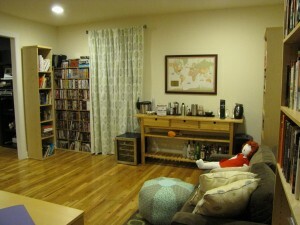 We hired someone to do our bedroom, the laundry room, the hallway upstairs and down, my studio, and the living room/kitchen.We figured we’d get to the library someday. 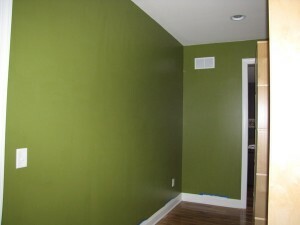 Then I painted the guest room and the dining room. Then the upstairs bathroom this past spring. 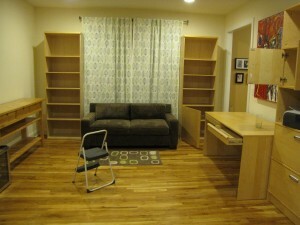 But the library was always so daunting because of all the books and furniture. So we kept putting it off. But I finally decided there was no way I was going back to school without tackling this project; it’s too big a project to do in a weekend or over several evenings. And it’s done, it’s painted. 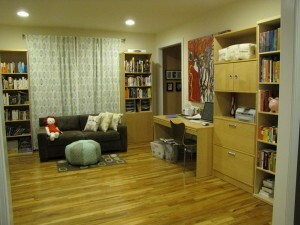 The furniture isn’t back in yet because I want to do some rearranging. And I’m still fussing with the trim–we used Ralph Lauren’s Olive Tree for this room, but the RL paint is a little stretchier and doesn’t leave as neat a line when the tape is pulled off (I never had this problem with Benjamin Moore paint). So here are some before and during photos. I don’t quite have afters yet, but I’ll post those when I get them. The library as it was before. 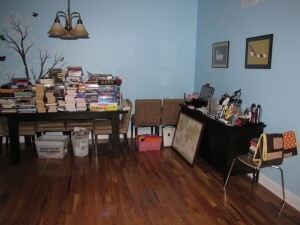 The dining room has been invaded by books! Temporary storage for library stuff. The library gets a makeover. Green library! Still fixing some trim at the bottom, but it’s almost done. 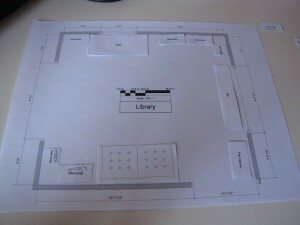 Adam made me this floorplan in Visio so I can experiment with furniture layouts. Fun! Hopefully I’ll have some final pics later in the week, but it’s going to be a crazy one so we’ll see. I’m baking 2 cakes, I’m painting at least one more room this week (Adam’s office), and I’m getting ready for school. I’m so glad this project is almost done.